Of course, GTD itself is just a discipline for gathering stuff to do, prioritising stuff to do, and getting it done in decent order. Implementation method is optional—and I’ve gone through several iterations (as shown above) on how to make it work for me. My problem with my implementation up until this week was that I’d stopped using it. I was using automation to stuff everything into Trello, using it as my collector. But I’d stopped looking there on a regular basis, and had started using Habitica’s To-dos as my collection point—not by intentional design, but by, well, laziness. Habitica has many virtues. Being a collector for possible things to do is not one of them. The least productive (things that I should just decide Not To Do), the hardest (high-value things to do that need to be broken down more), and medium value but non-urgent things to do all end up at the bottom of my Habitica list, getting redder and redder, their experience points getting higher, and breaking the game by providing experience points, gold, and mana all out of proportion to their true value if and when I finally get them done. I find this horribly demotivating in terms of getting the high-value items (like finishing my novel draft or making an appointment for a physical) done in a timely fashion. I’ve cut out the middleman. 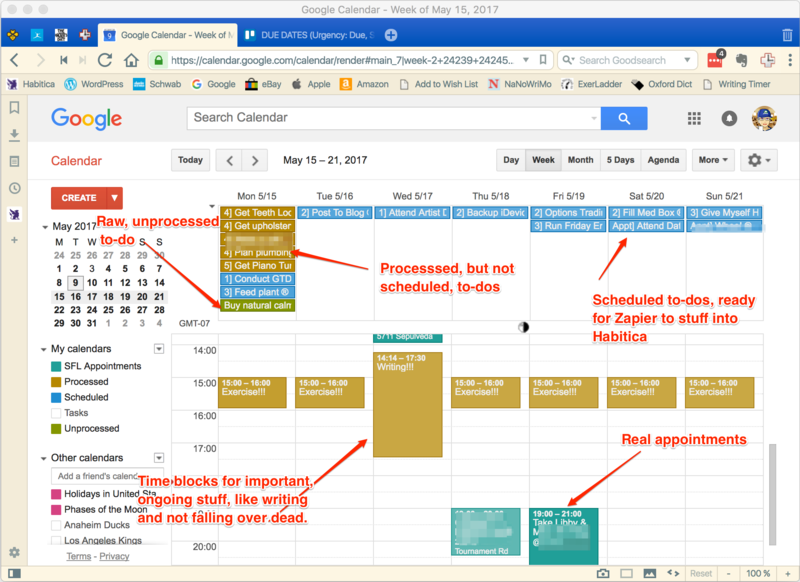 In order to do my weekly GTD review, I once had to open Trello, and open Google Calendar, and consider where to put my Trello cards on the calendar once I’d decided to do them this week. I then had a rather elaborate and failure-prone protocol for putting the lucky Trello cards into a special column so that Zapier would automatically place them on the Google calendar on the chosen day. Then I had another Zapier automation which would stuff them into Habitica just before they were due. Note that I don’t use the Google Tasks thing. They show up off to one side. I need to see my things-to-do stacked up on the day I plan to do them, as in my illustration. The to-dos are the all-day items. I’ve convinced IFTTT to dump raw to-dos from iOS Reminders and Evernote into that “Unprocessed” to-dos calendar and make them nominally due on the next Monday. On Monday I do my GTD review. I take anything undone from the last week, delete its to-do from Habitica and stuff its calendar item back into Processed and re-prioritise it. All the Unprocessed to-dos are either deleted or given a priority. Anything that is priority 3 or above is moved to an appropriate day in the “Scheduled” calendar. (I never put more than six items/appointments due on any one day, including writing and exercise—if I don’t have room for something, then either it or something else goes back into the Processed calendar.) I then move leftover Processed to-dos to the following Monday. Zapier then takes all the items added to Scheduled and stuffs them into Habitica at 00:01 am on their due dates. This way, no to-do hangs around in Habitica for more than a week, growing more and more evil. Monday morning I don’t have to open both Trello and my calendar, because everything lives in my calendar now. Zapier doesn’t have to try to parse Trello cards and stuff them into the calendar, just stuff the scheduled calendar items into Habitica later. Okay, I admit it. Programming all the automation is—dare I say it?—fun. And eliminating the Trello collection step makes it a lot simpler. So, onward to Getting Things (like more writing) Done.